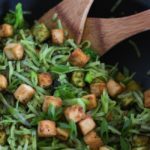 Tofu, fresh veggies, and noodles are tossed with an easy homemade teriyaki sauce in this simple weeknight meal. Teriyaki noodle bowls are packed with flavor and fun to eat! I’ve been in denial that September is here for the last 5 days. 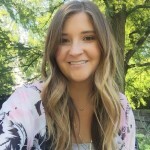 I’ve seen a lot of fall recipes out there, fall decorations, and have heard people saying summer is over. NO. Just no. It’s still summer, people! With that being said, September is my favorite month of the year. Why, you ask? It’s my birthday month! September 21st… which is the day before the fall solstice. SO, let’s enjoy summer a little longer, okay? Consider if your birthday gift to me. ? Before we jump into today’s (not-fall-related) recipe, how was your Labor Day weekend? We spent the entire weekend being lazy. Seriously, it was the laziest weekend ever. Saturday we did absolutely nothing (except sit in our pjs and watch Harry Potter weekend on Freeform) because it rained all day… and was rather chilly. It did actually feel like fall. On Sunday, the weather was much nicer for our neighborhood Labor Day party. I actually stayed in my pjs again… at least until it was time to put real clothes on and go. Anyone that knows me, knows I never sit in my pjs all day. Like, ever. I will admit, though that it felt amazing to do that! As for yesterday, I sort of continued the laziness by watching more Harry Potter. However, I did put real clothes on, did laundry, and cleaned the kitchen. Who knew I’d have so much to say about a lazy weekend? Anyway, let’s talk about these teriyaki noodle bowls! 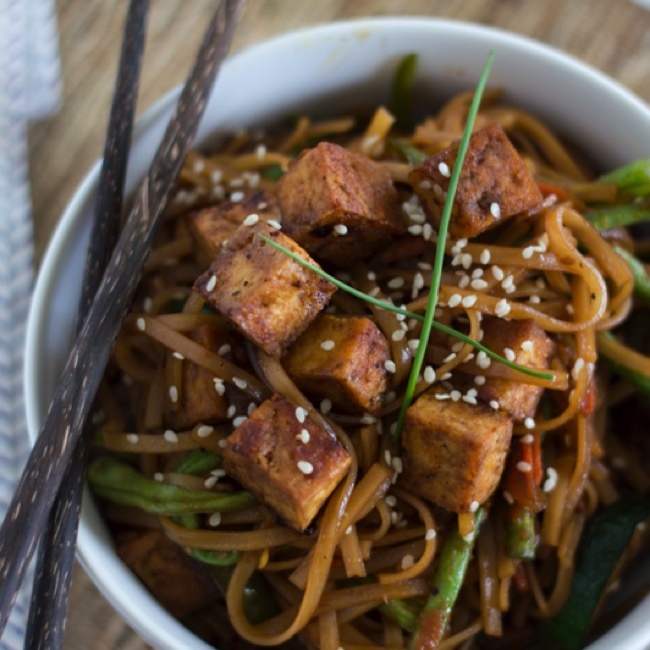 We’ve got crispy tofu, summer veggies, rice noodles, and a delicious homemade teriyaki sauce. Not only is this a vegetarian dish, but it’s vegan as well! You won’t even miss the meat, though. Always buy extra-firm tofu! It makes a huge difference in the texture… if the tofu is too soft, it won’t hold its shape. Press the extra moisture out. Even extra-firm tofu has moisture, so you’ll want to lay it out between layers of paper towels and top it with something heavy to press the moisture out. 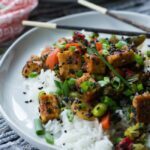 The drier your tofu, the easier it will crisp up! Season well! Tofu is really bland on its own, so you’ll want to make sure and generously season it. For this recipe, you’ll toss it with salt and pepper, crisp it up, and then add some of the teriyaki sauce. If you’re still opposed to tofu, you can just leave it out. Or, if you’re not vegetarian/vegan, you just can add your favorite protein. Chicken, pork, beef, or shrimp would all be delicious in this dish. 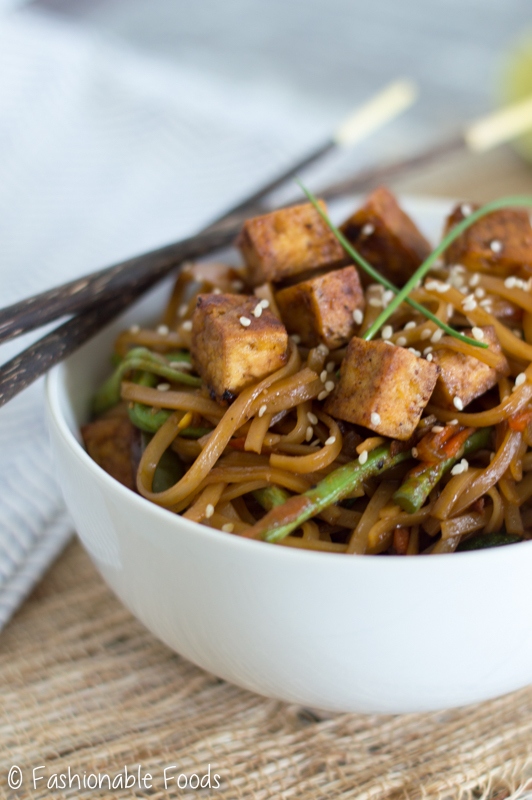 These teriyaki noodle bowls are addicting! Like, eat-straight-outa-the-pan addicting. Not that I would know about anything about that… ?. If you’re like me, you’re not quite ready to be back in the grind after a long holiday weekend. So, I highly recommend whipping up these crispy tofu and vegetable teriyaki noodle bowls. 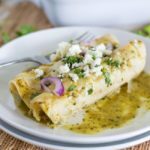 They are the perfect quick and easy meal! Make the teriyaki sauce by combining the soy sauce, water, mirin, sesame oil, coconut sugar, ginger, and garlic in a small pot. Bring to a simmer and allow the sauce to cook until slightly thickened, about 10 minutes. Meanwhile, lay the tofu cubes out on paper towels and cover with additional paper towels. Top with something heavy and let stand for 15 minutes. Soak the rice noodles in hot water for 15 minutes, or until softened and pliable. Drain and set aside. 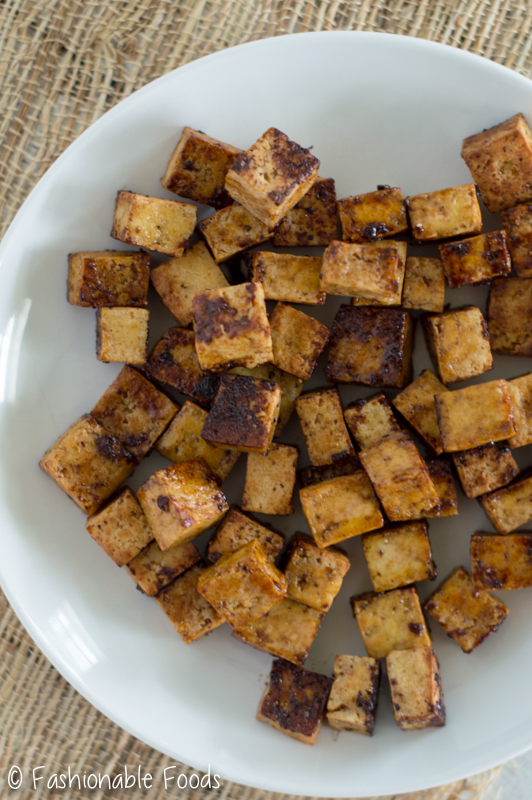 Place the tofu cubes in a bowl and toss with salt and pepper. Heat 1 tablespoon of the oil in a wok or skillet over high heat. Once the oil is very hot add in the tofu cubes and stir-fry until the edges are golden brown and crispy. Add in 2 tablespoons of the teriyaki sauce and stir quickly to coat the tofu. The sauce will absorb quickly and the edges will crisp up even more. Transfer the tofu to a plate and set aside. Heat the remaining oil in the wok and add in the onion and pepper. Stir-fry for about 1 minute and then add in the carrot, green beans, and zucchini. Continue stir-frying for about 2-3 minutes, or until the veggies are crisp tender. 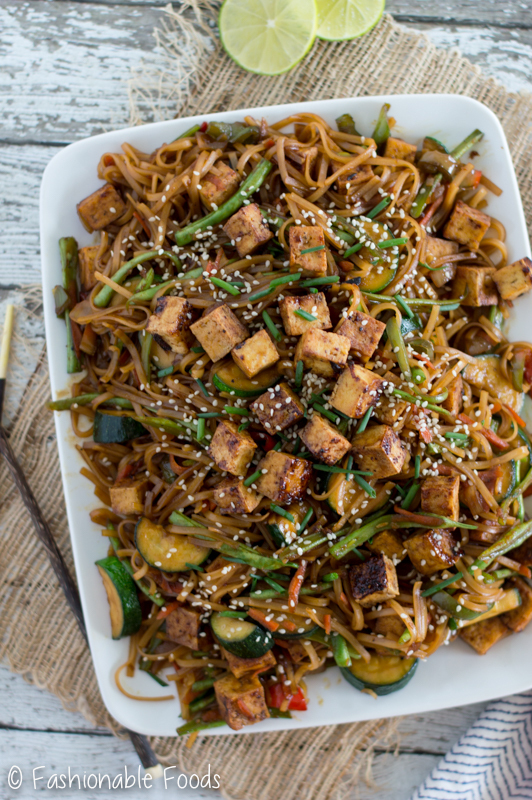 Toss in the noodles, tofu, and teriyaki sauce until well combined. 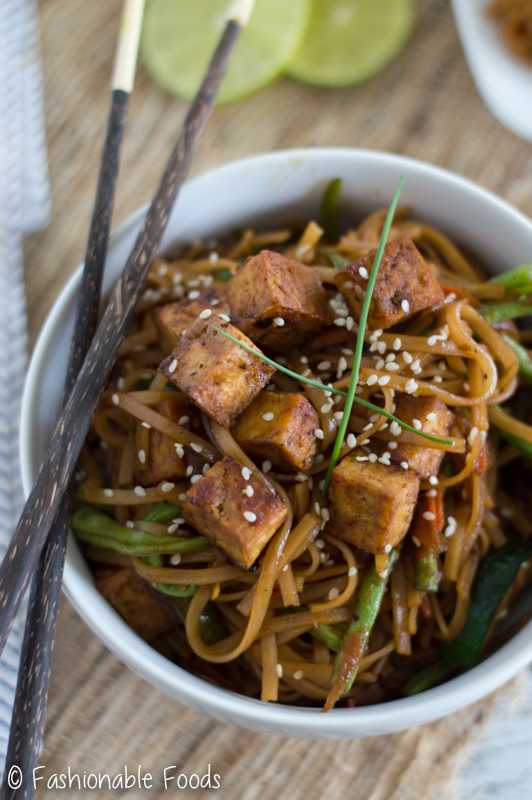 Pile the noodles into bowls and top with chives or green onions before digging in! *Tamari is a richer-flavored soy sauce that is naturally gluten-free. It's pretty easy to find, but if you can't, there are other available brands of gluten-free soy sauce. If you're not gluten-free, any brand of soy sauce may be used. *Regular white sugar or brown sugar can be substituted. 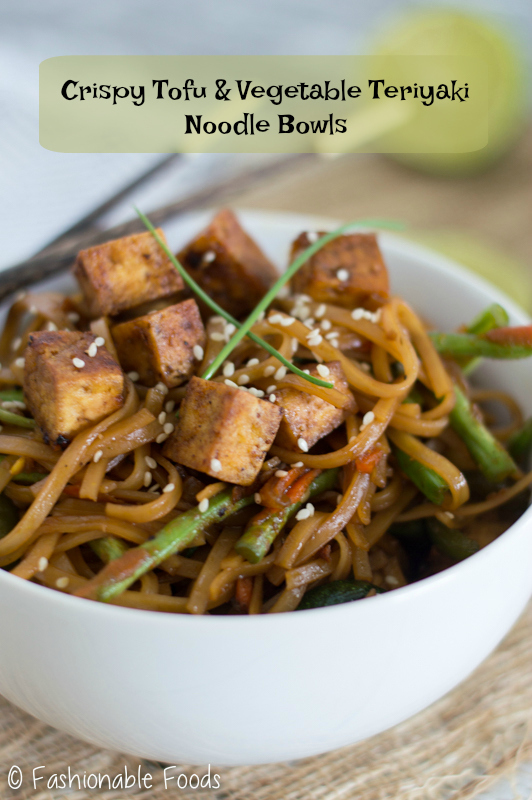 Vegetable Teriyaki noodles are my favorite. Loved that you added crispy tofu here, I am sure it tastes so delish. I am also loving the fact that you used homemade teriyaki sauce for making this. This is what I am looking for. I was planning to prepare a non-meat noodle and just use tofu instead. Teriyaki noodle bowls are a brilliant idea. I can’t wait to try this. I hope you enjoy, Sheila!